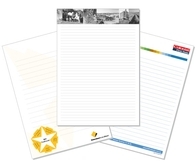 We make lots of different styles of notepads. If you don't see the specifications here for what you need, please contact us for a quote. This page is best used as a price guideline only. Please contact us for a quote if you require print to the edge.